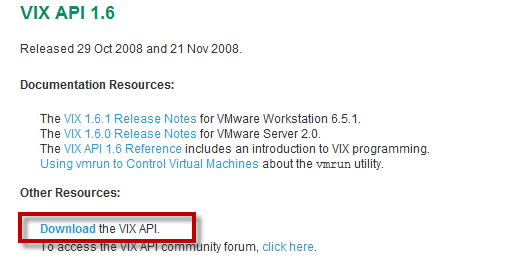 What is the VMware VIX API and it’s future? 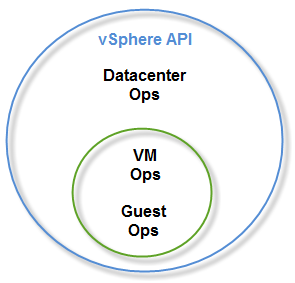 You are here: Home / What is the VMware VIX API and it’s future? Some recent twitter conversations about vSphere SDK improvements, specifically around VMware VIX API and few emails around the use cases was the motivation for this post. I will provide a very high level of what the VMware VIX API is, since there is a awesome presentation by Matt LaMantia at TechExchange in VMworld 2010 SF that goes into more details about VIX (video below). The VIX API (Virtual Infrastructure eXtension) is an API that provides guest management operations inside of a virtual machine that maybe running on VMware vSphere, Fusion, Workstation or Player. These operations are executed on behalf of the vmware-tools service that must be running within the virtual machine and guest credentials are required prior to execution. Currently if you want to automate your vSphere infrastructure and want hooks into your virtual machine and guestOSes you need to leverage both the vSphere API and VIX API. I have seen this cause some confusion in the communities. Users wanting to standardize on VIX API and realize that 80% of what they want to do is available in VIX but the portion requires the use of the vSphere APIs. Don't get me wrong, the functionality of VIX is very powerful. When I first learn in version 1.6.2 of VIX where it officially supported vSphere, a whole new set of possibilities just opened up for administrators and developers. There is also a very interesting application called VGC (Virtual Guest Console) created by the VMware Lab guys also known as flings. This is a graphical interface similar to VMware Remote Console, but it is 1000x better and provides integration to all the VIX operations. The application allows you to view running processes in a guest, kill a particular process, deploy application to a guest, download/upload files and browse guest filesystem and much much more. I would highly recommend taking a look at this tool! As you can see, the possibilities are endless! but you still have to use two separate APIs. 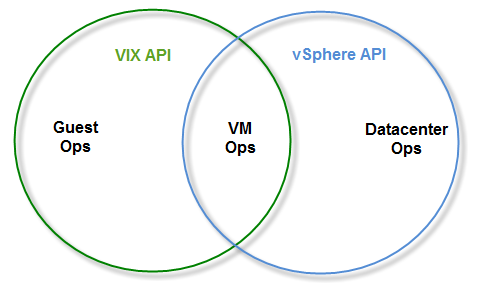 I along with others in the community have asked for a consolidation of the VIX API and merging with the vSphere API, makes the most sense. I think our feedback has finally been heard and if you watch the presentation given by Matt, you will see that future of VIX API is exactly that, consolidatation with the vSphere API. Though we will not see it anytime soon until the next major release of vSphere dubbed vSphere.next (MN) and vSphere.next^2 (OP), it is a change I am looking forward to. One other interesting thing to point out, during the first release of the VIX API that supported vSphere which was 1.6.2, there was a tiny bug that was identified regarding licensing. As you may or may not know, VMware requires that you have a "paid" license to be able to leverage the various APIs and CLIs for automation, configuration and management of your vSphere infrastructure. This is generally not an issue when dealing with vCenter or ESX, but with ESXi, you have option of a free license. In the VIX 1.6.2 release, you actually have full VIX read and write operations against an ESXi host using the free license. This was of course fixed in subsequent releases and the trick only works with ESXi 4.0 or older. You will notice on the VIX landing page, there is no mention of the release notes for 1.6.2 release other than 1.7.1 superseding it. You however still can download 1.6.2 release under VIX 1.6 and you can still see the release notes if you search on VMware's site or on Google. Guest Operations using VMware VIX APIs and Beyond from heyitspablo on Vimeo.